You can enter information here to send to the Reunion Committee for the Master List and have some of it appear on this page on the website. Information on this page has been submitted by our Classmates. You can add your info and photos, too. Later, you'll be able to come back and add/change/edit. • You can enter your own "NOW" Photo to be seen on the site. • We can add your Senior Photo from the 1969 Anchor. and whatever info you enter as "Comments." Be tasteful. Comments you post here can be seen by everyone/anyone. Your Email Address Will NOT automatically Display here, but there will be a click-on link for Classmates to send an email directly to you. ALL emails will go straight to you at the email address you provide, to give you a higher level of privacy. • If You WANT your email address to show up on this page, you'll need to enter it a second time on Question #3: My Email Address to Share. NOTE: Other than the items that we've listed above, the SHS'69 Reunion Committee will not add any of the other information to this area that has been collected by the Committee for Reunion purposes. If you prefer to not have any of your information appear on the website -- don't enter it here -- use the CONTACT US page instead to send it to the Reunion Committee. 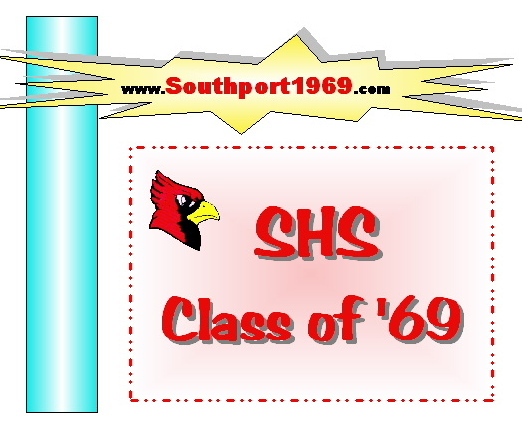 The collective Class of 1969, Southport High School, and the individual Members of the SHS'69 Reunion Committee can not be held liable or responsible for any misuse of this site or information obtained from same. From Dee: Retired from the Eiteljorg Museum of American Indians and Western Art (Director of Technology) in December 2017. Moved into new home in the Del Webb Britton Falls retirement community in October 2017. Totally enjoying retirement and my new home/community! I have one daughter who lives in Denver, Colorado with her husband and my two grandchildren, ages 6 and 8. So, I make frequent trips to Denver! Happy to be a Hoosier! Living in Indy on the Southeast side in Franklin Township. Blessed with Two Daughters, Two "Share Daughters," Four Son-In-Laws, Eight adorable G'Kids, and a good-spirited husband of 20+ years! Life is Good. I've been an Independent Real Estate Broker for 30+ Yrs. Scaling back, I now handle only select Buyers & Sellers and I teach. I'm a Real Estate Licensing & Continuing Education Instructor. Picking and choosing my Clients and Projects ~ Having too much fun to retire! From Gary: My wife Ann and I raised our family and had businesses in Zionsville, IN. In 2016 we bought a condominium in Fort Myers, FL as a winter retreat but decided to sell our place in Indiana and moved here full time in the summer of 2017 (two weeks before hurricane Irma). We play golf a few times a week and enjoy participating in many of the activities available in our 55+ community. I play in the men's 18 hole golf league and the traveling exec golf course league, pickleball, bocce ball, and work on projects for our new condo renovation in the woodshop along with a little Uber/Lyft driving once in a while. Ann still works (from home) as a medical coding auditor and teaches coding interns for a group of hospitals in the Fort Lauderdale area. She still manages to play golf with me twice a week and usually again in her league every Tuesday. We enjoy playing with our trivia team every other Wednesday evening in the Tee Room (our on site restaurant & bar). Poker on the other Wednesday nights, euchre once a month, Men's Club breakfasts, Florida Southwestern basketball or softball games, Notre Dame football SWFL fan club at Ron Daos Sports Bar, spring training baseball games, etc., etc., etc. keep our calanders full. From Mark: I have represented low-income working people, primarily migrant farmworkers and immigrants, in St. Louis, Texas, Chicago and Ohio. I graduated from a joint J.D.-M.S.W. program at Washington University in St. Louis after graduating from Ball State. I've been married for 34 years to Kathy Berry, a lay midwife and childbirth/parent educator. Both of our daughters were born at home. My wife is the best person I know and has helped me in both my personal and work lives. Our daughters are now grown and making a living. Their generation has had a more difficult time than us economically and I'm glad they're able to make a living. From Kathy: Jim and I will celebrate our 40th anniversary this September and are very thankful for all that the Lord has done in our lives. We met while in the military (me Army, him Navy) in the Tidewater Virginia area, but relocated to Charlotte, NC when he got out of the Navy and have been here for the past 38 years. Our oldest daughter, Kirstie, is married to an aspiring film composer, lives outside of Boston and has our 3 precious grandchildren - Bruce - 20 months, Thomas - 5 and Ivy - 8. Our second daughter, Elisabeth (Lizzy or Betsey) and our son, Chip, and his wife, all live here in Charlotte. Elisabeth is an office manager of a small firm and sings on the worship team of our church. Chip served 4 1/2 years in the US Army, including 14 months in Iraq, and after getting out went to school on the GI bill and got his BS in Psychology and is now working on his Masters in Creative Writing. From Howard: Maureen and I celebrated our 30th anniversary earlier this year. For the past twenty years we have lived in Potomac Falls, Virginia (in the DC metro area.) We love to travel and get together with friends. My daughter graduated from the University of Virginia two years ago and is working as a software engineer in San Francisco. My son will begin his freshman year this August at Purdue in the Krannert School of Management. For the past six years I have been part of a startup that the serves the federal government. In that time we’ve grown to over twenty five people. My areas of focus are organizational effectiveness, project and portfolio management, geographic information systems, and information technology. After serving in the Navy submarine force and getting an MBA, I spent most of my career in the telecommunications industry working for a monopoly, its main competitor, and a startup (that failed.) Spent a good deal of time coaching girls and boys lacrosse and am currently looking for opportunities to give back to the community. In Property Management with Muesing. Moved all over US with work, now settled back in Indy where I've kept a home for years. Favorite vacation is a sandy spot on a beach with a great novel and a margarita! As a Business Analyst and IT pioneer, I concluded 35 years at Herff Jones Inc. retiring December 31, 2012. Taking the company to electronic word processing, spreadsheets, and presentations from their manual counterparts, typewriters, ledgers, and overhead projectors, our Lord allowed me to build and manage the company’s first nationwide, private computer network and email system between its manufacturing plants’ mini-computers. I managed the HJ mini-computers before starting the company's transition to PCs, Servers, and now tablets. Our Lord allowed me to write over 100 programs and menu systems to support the manufacturing environments and data communication between them. Using the training manuals and programs I wrote, I trained the office staff and data entry personnel at all plants. For the last thirteen years before retirement, I tested, debugged, and improved the HJ automated sales program while supporting and training the HJ Scholastic Sales offices in its use. I'm spending reitrement currently as a stock analyst, author, and artist. Our book, If Only, is based on over 100 true events people and places on the Indianapolis southside. My wonderful wife, Linda, SHS '72, and I have been married since 1977. She is part-owner of Advantage Components Corp. CNC machine shop. Our beautiful daughter Sarah is a 2006 graduate of Purdue. She helped create the first wellness center for Roche Diagnostics worldwide here in Indianapolis. She continues to provide wellness training and programs there, making contacts worldwide. Owned and operated a computer consulting firm for 25 years. For the last ten years I have spent at Allstate Ins. in the Chicago area as a Sr. Techinal Designer. I plan on retiring at the end of 2010. I have been married to my lovely wife Sherri for 15 years. We enjoy traveling both in the US and abroad. I am sorry that I will miss the reunion, hopefully we'll be avaialbe for the next one. After nearly 30 years of employee benefit plan administration I'm now retired. I read an odd assortment of things and I knit and crochet baby clothes/blankets for charity. Still living in Broad Ripple, where I've been since 1986. Mostly I just try to get from one day to the next with as much dignity as I can muster. Some days I succeed and some I don't. Much like just about everyone else, I guess. I said at the 40th class reunion I was going to get on this site. 3 yrs later finally! I have been married going on 11 yrs to Kenny who is originally from Kinston, N.C. and has the southern accent that can't be mistaken. He has battled cancers since 2002 with rib cancer being this last week. Last year it was stomach and chest cancer (surgery successful) then hematoma found on both sides of this brain and again surgery x 2. Recovered beautifully. I still think 2012 will be a great year. Besides, Kenny has 9 lives!!!! I probably have gray hair from of this, but I keep it highlighted. Tee Hee! You all look younger and younger, how do you do it? I really feel bad about having missed the reunion. We could have danced all night. It looked like a fantastic get-together with a lot of people showing up. This site is a good idea though and I will peek in de-temps-en-temps. PS regarding our family web (edeus.se). It is in Swedish and contains basically our reunions. ( Every second year) Navigate to "Träffar" to view some photos. From Kenneth: Barbie (she's from Michigan) and I met & married in 1977 and have produce 12 (yes twelve) beautiful children. We now have 10 grandchildren. jewelry design (barbaraherndon.com) and distribute healthy chocolate (herndonchocolate.com) and loving it (as Maxwell Smart would say). Graduated from IU, married, relocated to WI, worked in electronics, aerospace and medical industries. Senior executive for a number of years, five years international business. Bought into a company, sold before dot.com crash, retired at 49 to Scottsdale, AZ. Bought and sold another company. Presently investing in technology and bioscience startups. Married to the love of my life. Vickie is an IU graduate, Butler MBA, professor and faculty manager. We are active in Tanzania missions, Phoenix charities and ISI, sponsoring international students at Thunderbird International Graduate School of Business. Wishing you all the best in your second half! I have been alot of places and seen alot of things. I have toured all over the USA , and have been abroad and gone for many years. This probably is where you think I'm going to say "I'm glad to be home". Well maybe alittle. I sure do miss the west coast. I have started a new family. My curant wife and I are going into our 15th year of marriage and we have Three children 9,7and 3 Life don't get any better than this. God Bless you one and all. From David: Having a great time living where people want to retire. I opened my studio back up and started writing articles, published a book of photos and have two more in the works. I have a photograph that was purchased for auction in Australia for a hospital neonatal unit. Pretty cool to have a photo auctioned and given back to the hospital to hang in the neonatal department. Auction was for the purchase of new equipment for the unit. President of Studio 1 Photographic and Editorial Services. Freelance writer and a writer for Examiner.com, the Tampa Bay Photography examiner. Just got back from a 2 month shoot out west for a book. hobbys: bicycle rider, build computers and teach software. I'm one of the people that you have "found" and can be taken off the where is he list! I attended SHS for 2 1/2 years and moved back to St. Louis half way through my senior year. While I graduated from another school, I feel that I am still a Cardinal. For some reason, I started thinking about how long its been that I was last in Indianapolis and thoughts turned to I wonder what SHS looked like now 40 years later (it doesn't seem that long ago!). I googled SHS and was amazed at the content of the reunion website. What a tremendous site that has rekindled some great memories of friends and events. After returning to St. Louis, I graduated from the University of Missouri with a BS degree and received a Masters degree from Webster University. I've been working in the Human Resources field for 36 years in St. Louis and for the past 16 years in San Antonio, Texas. I have been married to my lovely bride for 26 years and have a 21 year old daughter, Kristyn, who is a senior at Texas Tech University. I'm looking at my schedule for August and would like to join y'all at the reunion if at all possible. If not, at least I am not "lost" anymore! Thanks for providing me with a wonderful trip down memory lane. Go CARDS! From Steven: I retired from my long term job in 2007. Since then, I have been working as a computer consultant with an agency of the CDC in Cincinnati. I enjoy participating in the activities of the 55+ community that I live in and traveling to destinations in the US & Europe. I have one daughter, Natalie, who is married and lives in Portland, Oregon. She doesn't have children--yet; however I do have five darling step-grandchildren, and they all live in my neighborhood. They have known me as Gramma "Ita" since they were infants. After 32 years I still enjoy teaching at our community college in Albuquerque--although thoughts of retirement entice me daily. I'm looking forward to seeing you at our 40th reunion. From Jane: Gosh, It is impossible to think we have been out of school for 40 years. I really can't believe we are all close to 60. Remember how old we thought our parents were????? haha What goes around comes around. I never re-married, couldn't find anyone good enough, haha. From Dee: Hi: Sorry I won't be their. 40th Wedding Anniversary same day. I hope all is fine with all. From Debra: I will become a grandmother for the 2nd time this September. Another grandson...still hoping for a grand-daughter someday! I am married to Danny Quinn. We enjoy snow skiing and trips to Lake Cumberland. From Dean: I graduated from Purdue in 1973 with a BS degree in Industrial. I retired from Philips in 2017. Management. I worked for a few years for a small company in Beech Grove, IN before returning to college. I obtained a BS degree in Mechanical Engineering in 1979. In 1980, I moved to Seattle and obtained a postion with Advanced Technology Labs (ATL) as a Mechanical Engr. ATL was acquired by Philips Healthcare, Ultrasound Division. I am currently a Project Engineer with Philips. I have been working for about 20 years for a very small state agency that provides advocacy training and related programs for people with disabilities and their families. Its a fun job! I live on the east side with two cats who keep me entertained and am favorite Aunt to nine nieces and nephews. For those of you who remember me I still read books, a lot! From Scott: Remember the 1960s introduction to the Wide World of Sports...the thrill of victory and the agony of defeat. My life after high school has been quite an adventure. Soon after high school I married and became a father. Worked a lot of interesting jobs and went to night school, but I ran into several health problems. Today I have a 39 year old daughter Melinda who sells real estate in Gatlinburg, TN and an 88 year old mother who moved in with me for health reasons. I celebrated 30 years at Carpetland USA dba Floors to Go last week, they won't let me retire so I guess I am here for life. I have a modest home with a cool game room and big garage with guy toys. I love sports cars and motorcycles. Twice divorced and currently single I still need to grow up but I have been cancer free for two years and am enjoying my life. 7 wonderful grandkids - joy of my life. Miss the old high school days - but loving life now also. Lived in Indiana since high school except for one year, lived down in Florida (loved it except for being away from family). Haven't been to a reunion yet - wanted to but life got in the way! Just getting involved in 'League of Miracles' - for special needs people and loving it!!! Also am agent for UFirst, helping people get out of debt. It's so nice to catch up on everyone.....Thanks Dee for the website. From Max: I have 3 wonderful children, and 3 grandchildren. From Yvonne: I have been fortunate enough to work with communities for most of my adult life. In the process my son, daughter and husband have endured my endless looking over the next mountain and pulled me back when I tilted one too many wind mills. I hope to make it to the reunion. I have no idea how to explain what I do for a passion or employment, but this clip of a documentary I worked on may be the easiest explanation. I am proud of it. You will possibly remember some of the incidents in the documentary. UCLA put it on line for us, I got to present it at several conferences (including South Africa) and eventually it won a Regional Emmy. From Linda: Bob and I met in Drivers Ed as sophomores at SHS and managed to stay in contact through our college days and a stint in the Army. We've lived in Washington State since 1999 where we planned to retire but I felt compelled to examine eyes again so I'm seeing patients and Bob is scratching his head.